Hi Everyone! 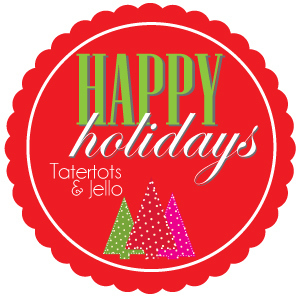 It’s SUCH an honor to be here at Tatertots and Jello sharing a craft for the upcoming holiday season. I don’t know what it is but I am just itching to bring out the Christmas décor this year! 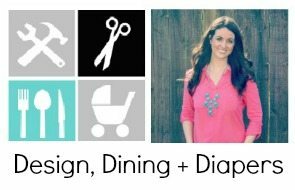 I’m Taryn from Design, Dining and Diapers, a place where I share DIY projects and tutorials, seasonal crafts and easy recipes. 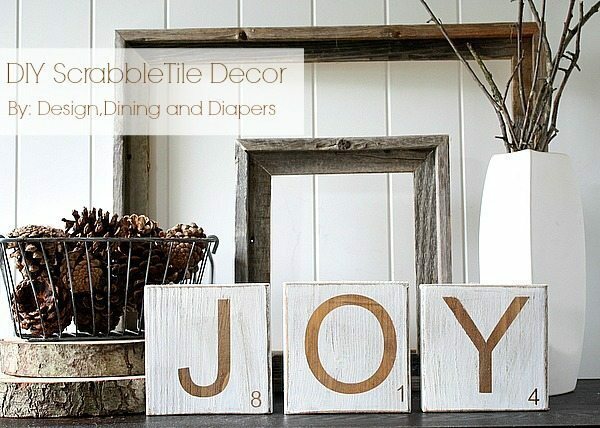 Today, I’m going to show you how to make these Distressed Scrabble Tile Decorations for your holiday décor this year. And in reality, they could probably work year round as well, making them a great gift. 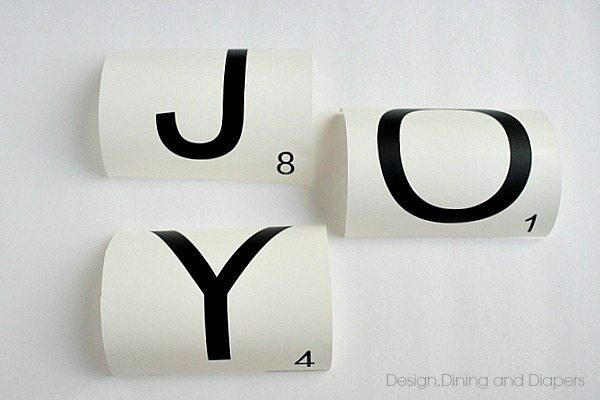 You can personalize them by choosing different words related to the holidays or something meaningful. I am the type of person that saves all of my wood scraps from various projects and this is one of the many times when I am glad that I do! 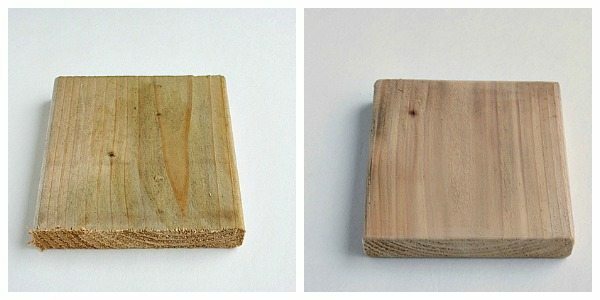 For this project, I used left over wood from our Garden Slat Wall , cut them into 5 1/2″ X 5 1/2″ pieces and then sanded down the edges. 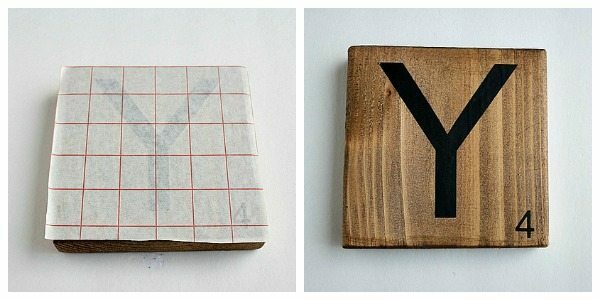 If you don’t want to cut your own pieces you can buy ready made blocks at your craft store. 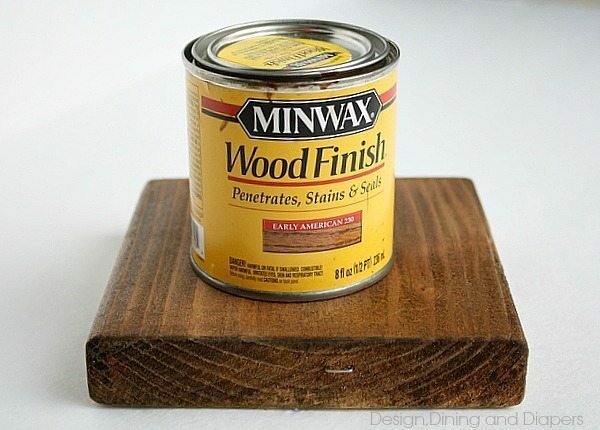 Next, I gave them one coat of Miniwax Early American Stain. I always prefer to apply my stains with a soft cloth but you could also use a foam brush or roller. Using my Silhouette, I created my vinyl letters and numbers in Arial font. 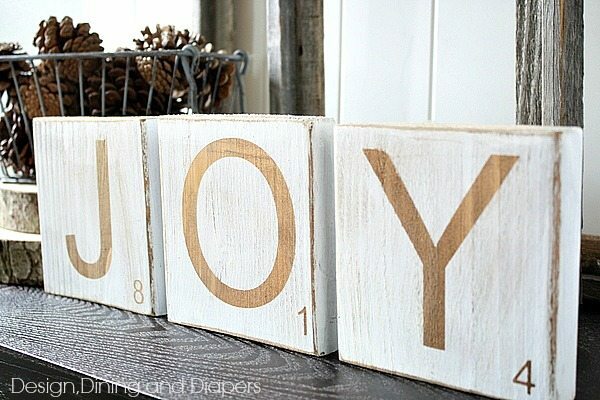 If you don’t have access to a machine, you can just as easily purchase 4″ vinyl letters and 3/4″ numbers at a craft store. Using transfer paper to apply the vinyl to the blocks makes the job that much easier! At this point, if you like what you see you could easily stop here. The stain with the black letters give them a real vintage look. But I decided to take them a step further for a different look. I am a really big fan of tone on tone and decided to make these blocks another victim of my obsession. 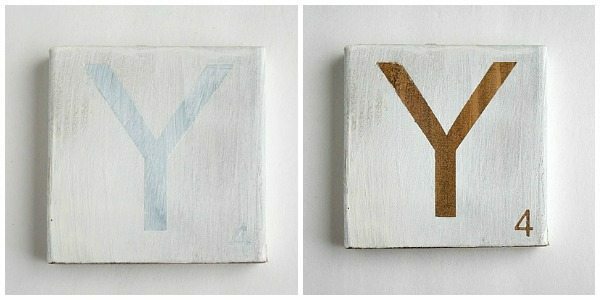 I covered the blocks in a coat of white paint and let them dry. The trick to painting over vinyl is to apply a really thin layer of paint so it doesn’t bleed underneath. Then, using a sheet of 120 grit sand paper, I gently distressed the blocks and the edges. And to finish them off I gave them a coat of satin polyurethic sealer. 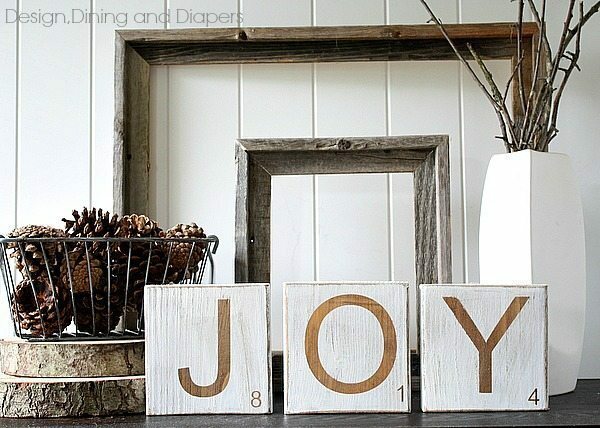 A really simple project that can make a fun piece of décor or a great gift for the holidays. And a huge thanks to Jen for having me over today! Thanks Taryn! I just love those tiles, don’t you? The possibilities really are endless. You could even do a different word on the opposite side to use it for two different holidays! Hop on over to Design, Dining, and Diapers for more great crafts and tutorials! 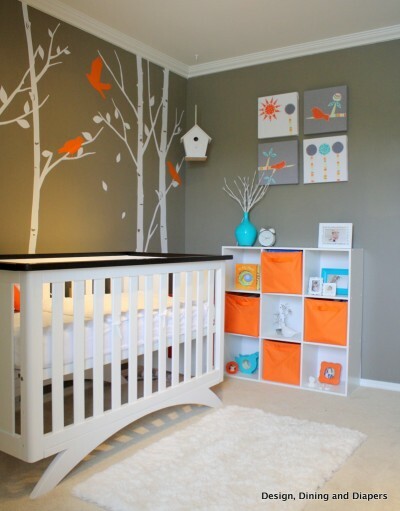 This Modern Bird Inspired Nursery she put together is so adorable, bright, and fun. The color combination she used, mixed with the white is just beautiful! These Tissue Paper Pumpkins would be such a unique addition to your Thanksgiving table this year!! 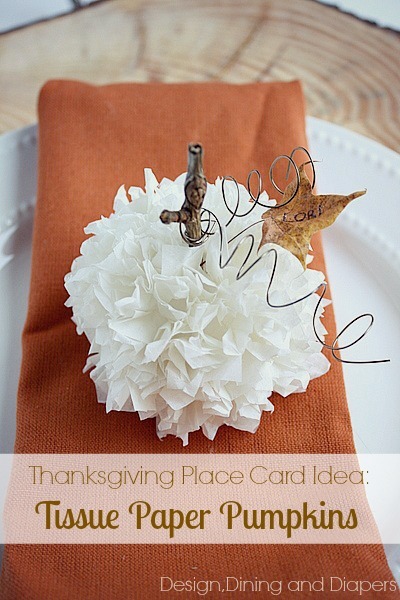 I love the rustic leaves mixed with the delicate white tissue paper. 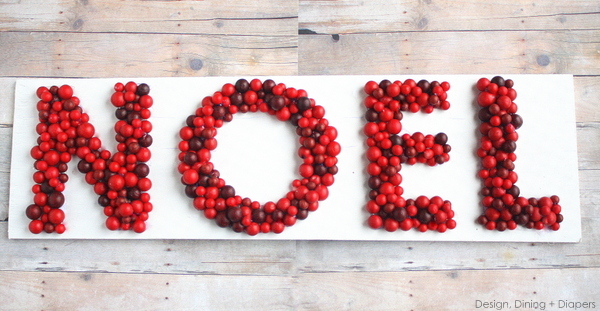 This 3D Noel sign is so simple to make, but will add such beautiful color to your Christmas decor! I love this idea! I am thinking about trying to makes these with my last name!!! I love them! So creative!! 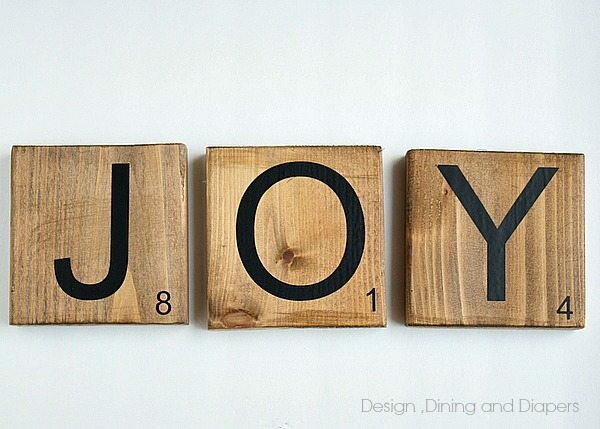 I just love the scrabble tiles, and anyone can do this. I like the simple stuff with purpose. Good job to both of you. So cute, Taryn! I am a real scrabble nut- love these!! Those tiles turned out wonderful! Thanks for sharing your tutorial! Taryn I love these so so much! My game loving family would be all over this! Can’t wait to make this project! Thanks so much. These are too cute! LOVE them! These are so cute! I love the scrabble idea! Oh my word- I SO LOVE THOSE. But then again- I love Taryn & everything she does. 🙂 Happy to see her over here today Jen. This is the most fun holiday sharing ever! Ahh, these are super cute! I think I know what I’ll be doing this weekend! Love the scrabble tiles. Great job! 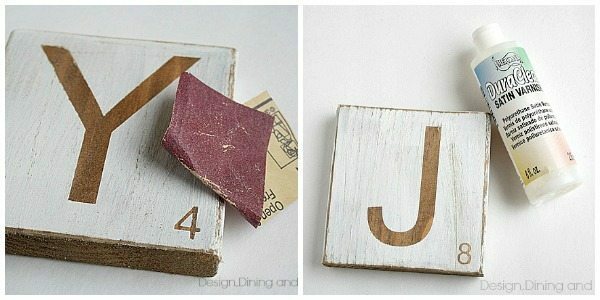 Taryn, great tutorial on the DIY scrabble letters. So cute!